Wed, Sep 6, 2017, 10:29 pm SL Time, ColomboPage News Desk, Sri Lanka. Sept 06, Canberra: Australia and Sri Lanka have signed a Memorandum of Understanding (MOU) today to reinforce cooperation between the two countries on counter-people smuggling. Australia's Department of Immigration and Border Protection said the two countries have today dealt a blow to people smugglers operating in the region through the signing of the MoU enabling even closer cooperation between the two countries on counter-people smuggling. The MOU will facilitate the return to Sri Lanka of people who are involved in people smuggling activities. It also paves the way for enhanced information sharing on methods for tracking, intercepting and investigating people smugglers. 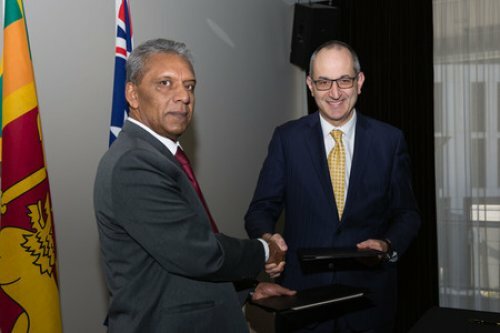 The MOU was signed at a ceremony in Canberra by Department of Immigration and Border Protection Secretary Michael Pezzullo and Sri Lankan Secretary for Defense Kapila Mudantha Waidyaratne. "Australia's strong and cooperative relationships with international partners including Sri Lanka are an important part of Australia's multi-layered approach to combating people smuggling and preventing people from risking their lives on illegal boat voyages to Australia," the Department of Immigration and Border Protection said in a statement. "Since Operation Sovereign Borders began in 2013, every attempted people smuggling venture from Sri Lanka to Australia has failed. This MOU demonstrates the resolve of both countries to see that success continue," it noted. The agreement will also see further cooperation between the two nations on countering human trafficking, stopping the movement of illicit goods and targeting money laundering and proceeds of crime. Training and cooperation in Australia and Sri Lanka will give officers from both agencies the opportunity to strengthen their skills across these areas and foster closer working relationships. Australia has a long history of successful cooperation with Sri Lanka on people smuggling and a range of other transnational crimes. Today's agreement provides a strong indication that this type of cooperation is set to continue and expand.